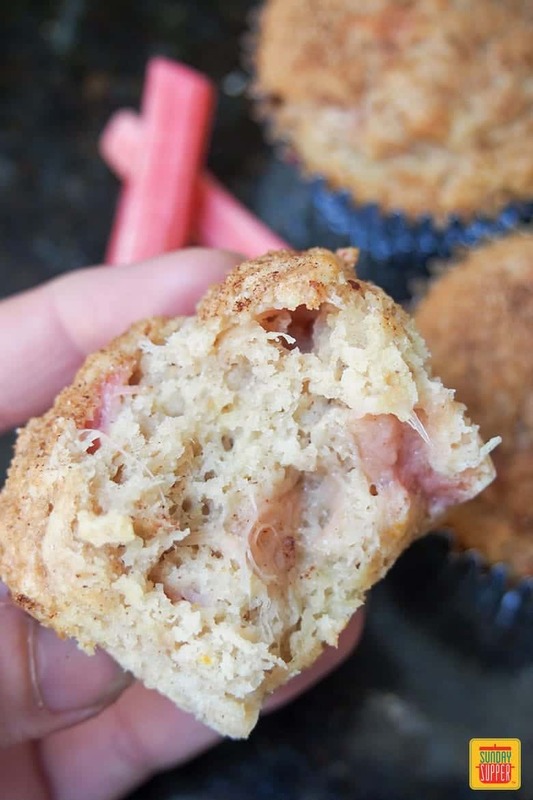 Wonderfully moist rhubarb muffins have a delicious, fruity sweet-tart flavor, topped off with a gentle crunch thanks to their cinnamon sugar topping! Grab and go for an EASY snack or breakfast. Rhubarb is one of the first bursts of color in spring produce, and it adds a lovely flavor and tartness to everything you cook it with. If you aren’t familiar with cooking with rhubarb, you should give it a try this spring. Rhubarb works well paired with other fruits, particularly strawberry—as in our Strawberry Rhubarb Crisp—but it’s also great as a flavor in and of itself. Line 8 muffin molds in a tin, or simply grease with butter. Preheat oven to 375°F. Gently combine stewed rhubarb, flour, baking powder, cinnamon, vanilla, oil and sugar in a bowl. You want it well-mixed, but ideally don’t want to break up all the rhubarb. Divide the mixture into the muffin molds. Mix the sugar and cinnamon together for the topping, and sprinkle over the muffins. Bake for approximately 15 minutes until golden on top. A skewer put in the middle should come out clean when the rhubarb muffins are done. 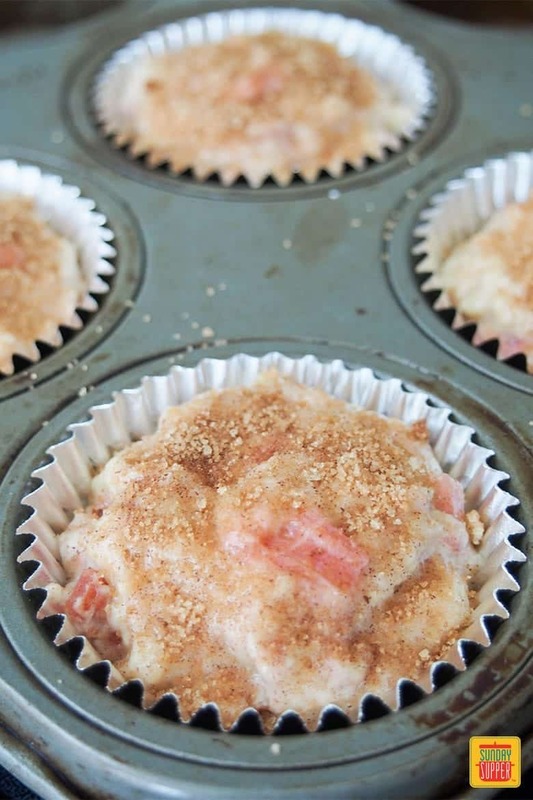 Like most muffins, rhubarb muffins are best used on the day they are baked. However, if you have any leftover, you can keep them covered at room temperature for a couple of days. Do Rhubarb Muffins freeze well? 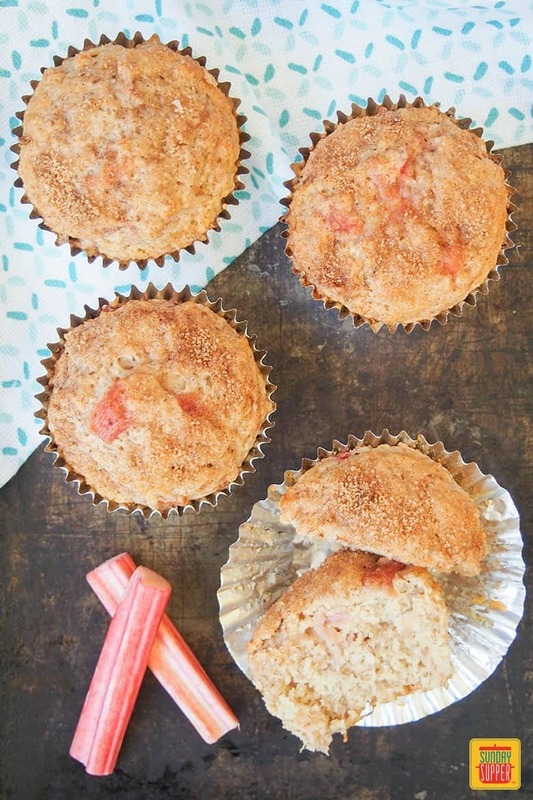 Yes, you can freeze rhubarb muffins to use at a later date. Bake the muffins as usual, then put a few in a single layer in a freezer bag, seal it up and freeze. That way, you can easily take them out when you are ready. RECIPE TIP: Defrost your rhubarb muffins overnight in the fridge, or more quickly by using the microwave. 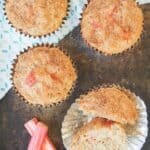 Rhubarb muffins are so easy to make and offer a tasty change from more common muffin flavors. They are moist with a crunchy cinnamon sugar topping, and have a lovely sweet-tart flavor from the rhubarb – perfect for breakfast or a mid-morning snack! 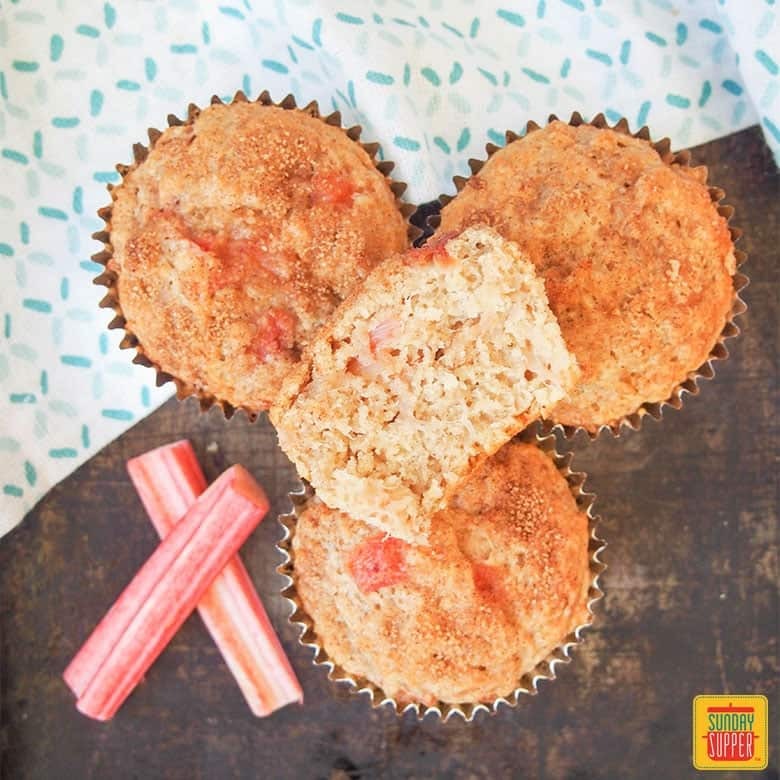 Let us know what you think of these rhubarb muffins in the comments below! Wonderfully moist RHUBARB MUFFINS have a delicious, fruity sweet-tart flavor, topped off with cinnamon sugar! Grab and go for an EASY snack or breakfast. Line 8 muffin molds in a tin, or grease with butter. Preheat oven to 375°F. Put the stewed rhubarb, egg, flour, baking powder, cinnamon, vanilla, oil and sugar in a bowl and gently combine. You want it well-mixed, but ideally don't want to break up all the rhubarb. Divide the mixture between the muffin molds. Mix together the sugar and cinnamon for the topping and sprinkle over the muffins. Bake for approximately 15 minutes until golden on top and a skewer put in the middle comes out clean. 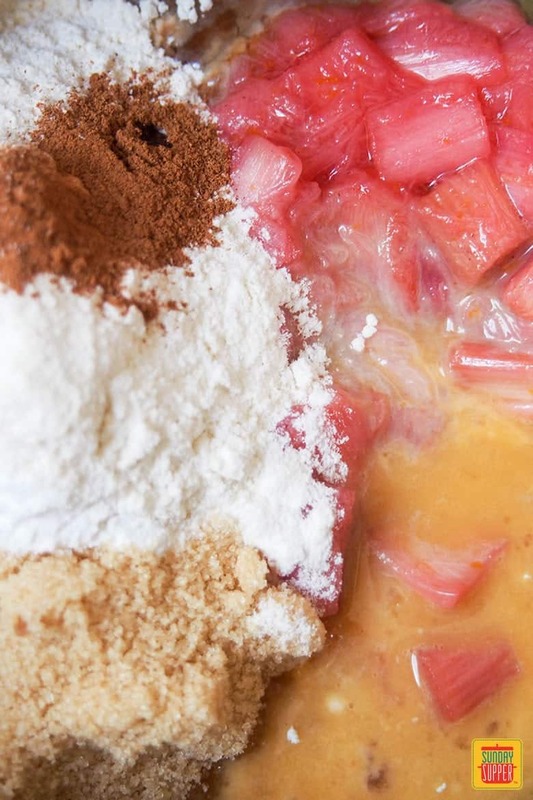 If you're concerned about over-mixing the batter or breaking up the rhubarb too much, you can mix together the dry ingredients first then add the rest. This recipe assumes a slightly tart stewed rhubarb, as in our recipe - if yours is very sweet, you may need a little less sugar. You can easily scale up this recipe by multiplying up all the ingredients. I’ve never had rhubarb muffins but I love rhubarb. rhubarb crumble is my favourite crumble!! However, It’s not easy to find rhubarb where I live but will definitely save this recipe for when I do! Those muffins look so good! Thanks so much, Jacqueline! We’re big fans of rhubarb, too. We’ll be sharing a rhubarb crumble recipe soon. Keep an eye out!